The green rose (Rosa chinensis viridiflora) is characterized by the fact that it only produces sepals and does not produce petals like other rose bushes. It has a peppery scent rather than a sweet perfume scent and grows to a height of 3 feet. Despite the differences, growing green roses is the same as any other rose bush. 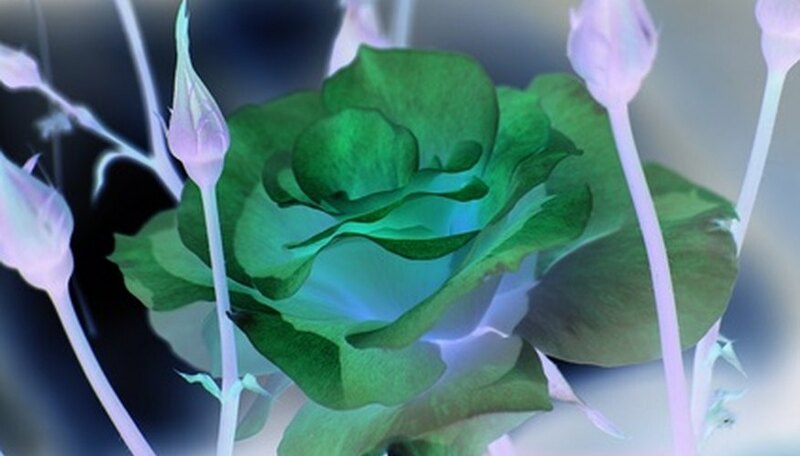 There are several varieties of green roses: Green Rose, Green Ice, Green Diamond and Greensleeves. The green rose is considered a novelty cultivar. Not a hardy rose bush, it will die in the coldest of climates but it does well in USDA zones 5 and 6. Select a spot in your garden where the green rose bush will receive adequate sunlight of four to six hours daily. The green rose bush will need 2 feet of empty space surrounding to allow for growing room and air circulation. Clear the area of excess weeds, grass and rocks. Dig a hole 6 inches wider than the planter in which your green rose bush is purchased in. The hole should be deep enough for the crown of the bush to be covered with soil. A good rule of thumb is to plant the rose bush 1 inch deeper than it is in the original planter. Till the walls of the hole with a garden claw while mixing in a ½ cup of bone meal with the loosened soil. Remove the green rose bush from its planter and gently loosen the root system. If the rose bush is root bound, you can place the plant in a bucket of water for several hours to loosen prior to planting. Place the bush into the hole and cover the root system with garden soil. Water the green rose bush generously enough that the moisture will reach a depth of at least 12 inches. Lay a thick mound of mulch around the bush to keep the area moist. Tree bark or pine straw are good choices. Fertilize your green rose bush with rose food as it blooms. Maintain a fresh supply of mulch as needed. Consider adding a supply of ladybugs to your new rose bush area for aphid control or you can spray with a commercial insecticide. Prune the bush of dead and darkened branches in early spring with pruning shears. In the winter, cut the bush back to 24 inches and tie the branches together with yarn or twine. Plant green roses in an area where its green color will stand out. Green roses can be difficult to locate and purchase. You may need to order through a specialty nursery.